United Nations Secretary-General Kofi Annan is to convene a summit in June to try to bring world attention back to the problems of development. 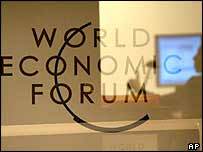 The focus on security of the past two years had overshadowed the plight of the poor, he told the World Economic Forum in Davos. "It is time," Mr Annan said, "to rebalance the international agenda." But his call for more equitable trade came as ministers said stalled trade talks would not be finished this year. A meeting of trade ministers from 19 countries had gathered on the sidelines of the forum to try to thrash out a way to return to the negotiating table. Talks over a new world trade treaty in Mexico last year fell apart over the agricultural subsidies paid by developed countries to their farmers. But the session, attended by World Trade Organisation Secretary General Supachai Panitchpakdi, concluded that there was little chance of finishing the stalled trade talks by the December deadline. "I am not negative about it, I am realistic," said Swiss president and economics minister Joseph Deiss, who convened the informal meeting. "There is too much to be done to have an agreement in 2004." For Mr Annan, the stalled talks were one symptom of the way the spotlight had veered away from the problems of the world's poor in the past two years. The vehicle for kick-starting thinking about development is intended to be the meeting the UN is planning in New York in June. It is designed to broaden the Global Compact, a document signed by business leaders five years ago committing them to play a bigger role in fighting poverty and in issues such as the Aids pandemic and corruption. "Business... has a powerful interest in helping to prevent the international security system from sliding back into brute competition based on the laws of the jungle," Mr Annan told the Davos forum. He made clear that however justified the focus on security since 11 September 2001 had been for richer countries, they risked abdicating their responsibilities to their poorer neighbours. The first purpose of the UN, he noted, is to take collective measures to ensure the security and wellbeing of all nations. "We must show that the UN is capable of fulfilling that purpose, not just for the most privileged members who are understandably preoccupied with terrorism and weapons of mass destruction," he told his audience in Davos. "But the UN must also protect millions of our fellow men and women from the more familiar threats of poverty, hunger and deadly diseases." Part of the problem, he said, was "dwindling investment in those parts of the world where it is most needed", and trade talks which have left in place "egregious biases against developing countries". 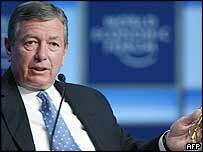 Also on Friday's Forum agenda were US Attorney General John Ashcroft and two leading members of Iraq's government - albeit not Paul Bremer, head of the US occupation authorities. Mr Ashcroft was forced to defend the US War on Terror, asking the "entirety of the world community" to rally round and help rebuild Iraq. "We know in no uncertain terms that we are incapable of having the kind of success alone that we could have working together," he said. He admitted that the US had been particularly remiss in communicating with the Islamic world. "We need to improve our performance and are interested in finding ways to do that," he said. 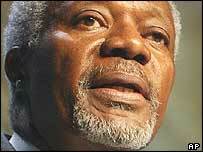 "Annan believes the world should focus on the war on poverty as well as the war on terror"